Store Credit, which is known as a virtual account given by the shop, is an attractive payment method for both customers and store owners. Clients are steered to purchase more and earn higher rewards while the store can boost its interaction with the customers as well as save time and money when it comes to the product refund. Check out Magento 2 Store Credit extension to take full advantages of customer credit. 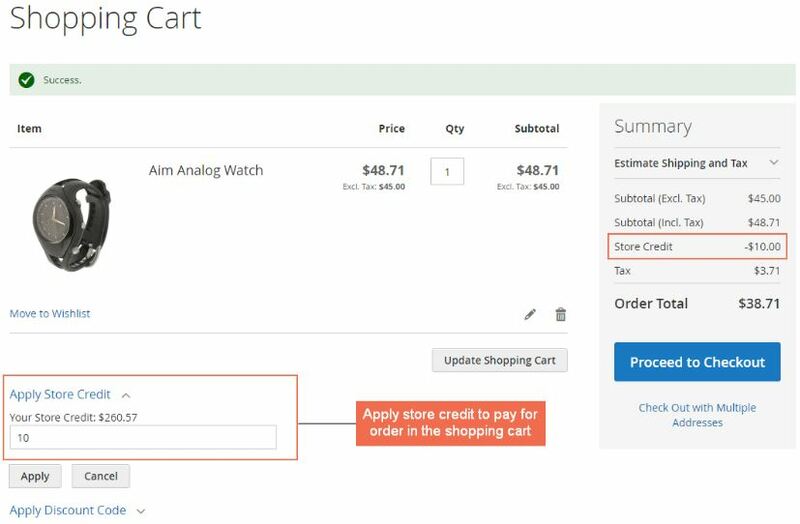 This Magento 2 extension allows admins to offer store credits which users can apply in the checkout process, or pay for shipping fee and tax. Magento 2 Store Credit extension also serves as a handy tool for the store to reward customers for each purchase and make the refund if needed. 1.1 Does the Magento 2 Default Support Store Credit Feature? 1.3 How Can Magento 2 Store Credit Extension Benefit You? Store Credit for Magento 2 is used as a regular payment within websites. Providing customers with a virtual credit encourages them to spend more and use their credit scores to pay for purchased items, shipping rate, or taxes. Moreover, instead of cash, the sellers can directly add refund amount to Magento 2 store credit for buyers’ further orders, which not only help store save its real money but also increase the coming-back rate. 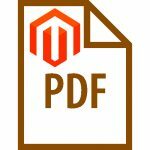 Does the Magento 2 Default Support Store Credit Feature? As a website-friendly open source, Magento 2 supports various of payment methods for admins to apply. However, the Community Edition default lacks the store credit which is more frequently used by e-commerce sites. Thus, we come up with Store Credit for Magento 2 extension to fill this shortage and make it more convenient for the buyers and seller with easy-to-use features. Track the store credit history via Transaction Grid and identify the credit using trend in Report chart. How Can Magento 2 Store Credit Extension Benefit You? 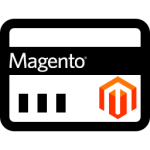 Store Credit for Magento 2 extension speeds up both purchasing and refund process. For customers, they can save money by spending available store credit scores on any purchases and applying direct deduction from virtual wallet to further orders. For sellers, our Magento 2 Community Store Credit effectively boosts the buyer engagement and get more coming back as customers often want to make full use of the credit value. 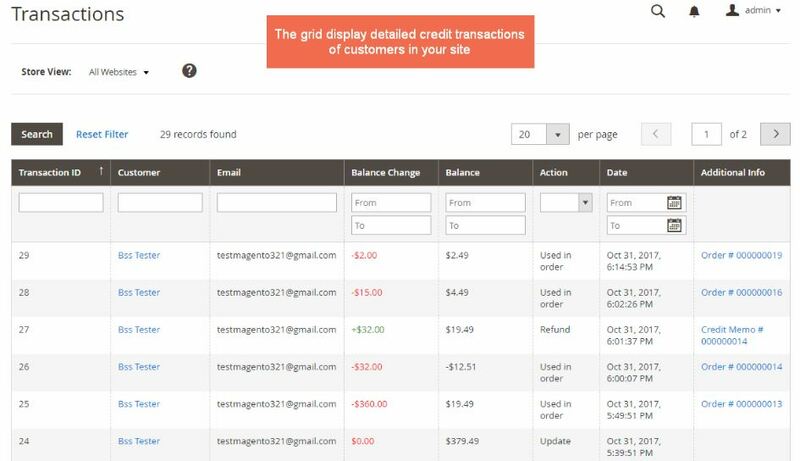 Transaction grid and Report chart keep admins being updated with the modification in customer credit balance for further marketing actions. Let’s get started with store credit general configurations Store ⇒ Configuration ⇒ BSSCommerce ⇒ Store Credit. 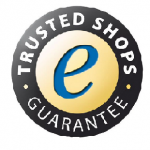 Please choose Yes to have Magento 2 Store Credit worked on websites. Admins freely determine the use of customers’ credit account. 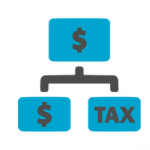 For example, customers are allowed to use the credit amount on checkout page and shopping cart page while tax and shipping will not be covered by credit scores. You can make any changes in configurations to fit your sites and increase customers’ loyalty. Note that notification emails are helpful to alert customers the status of credit balance and remind them to come back to sites and spend abundant store credit value. Admins can either choose default email template or create new templates in Email Template of Marketing section. 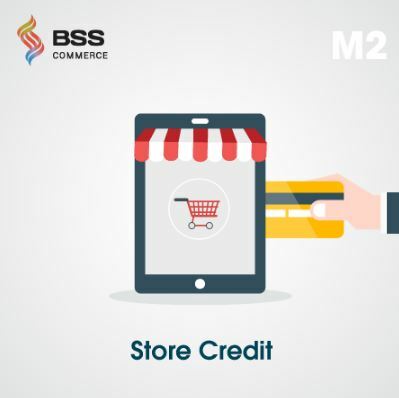 To figure out how effective Magento 2 Store Credit work on your sites, BSSCommerce’s extension provides Transactions grid and Report as well to overview credit change history. Here is an example of store credit report chart in the backend of Store Credit for Magento 2 extension. To get detailed store credit information of any customers, please go to Customers and select Edit to be redirected to Store Credit tab in which admins can get a personal credit statistic and history. Update new credit value on special occasions or for frequent purchase and choose and send customers emails to encourage more orders. 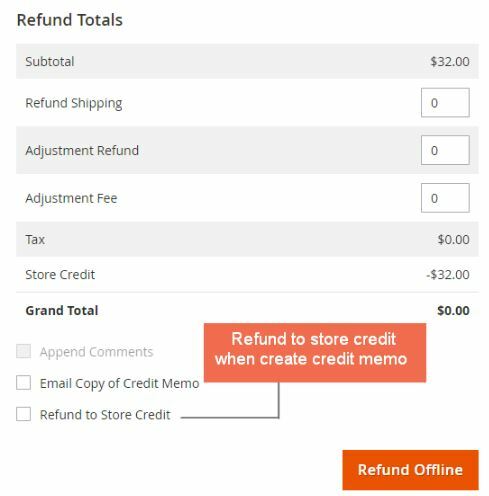 When it comes to order refund, admin can make a quick refund to customers’ store credit wallet by following Sales ⇒ Credit Memos ⇒ Refund to Store Credit. Hope that with some examples of backend configurations, now you can have your settings to display for customers to use. Let’s have a closer look at the frontend of Magento 2 Store Credit to see the configured results. 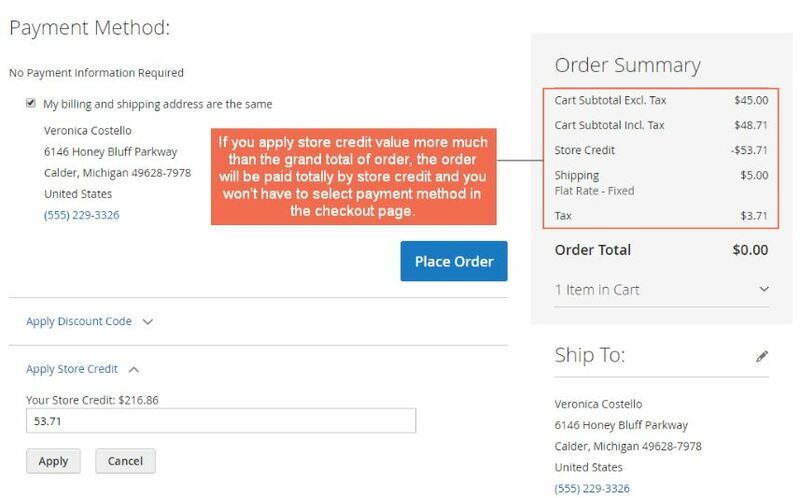 After adding an item to the cart, customers can reduce the payment amount using available store credit values on the shopping cart or the checkout page, and shipping fee as well. If the amount of spent credit is smaller than the total order value, the customers are required to select a default payment method to complete the checkout process. If it is bigger; the buyers are free from choosing another method to make payment. 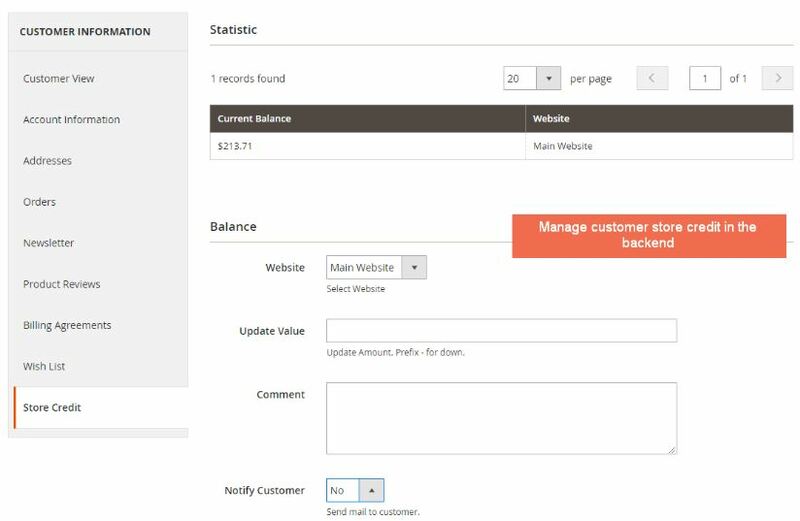 Beside notification email, with Store Credit Information in Magento Store Credit extension, it is easy for customers to control over credit balance changes. Thanks to Store Credit for Magento 2 extension, the process of refund and purchase becomes much quicker. Both store owners and customers can easily manage over credit balance for future actions. Our reasonably priced Magento 2 Community Store Credit comes along with free installation, free 1-year support and lifetime upgrade.